A collection of military badges, medals and other insignia — displayed proudly in a glass-and-wood frame case — sat on the couch beside Siletz resident Kathy McGrath. “He joined up shortly after high school,” she said of her late father, Elmer Dickason. The late World War II veteran, family man and Siletz native died on Aug. 23, aged 92, at Oregon Health and Science University Hospital, where he was hospitalized for an arterial ulcer he developed after being diagnosed with diabetes. 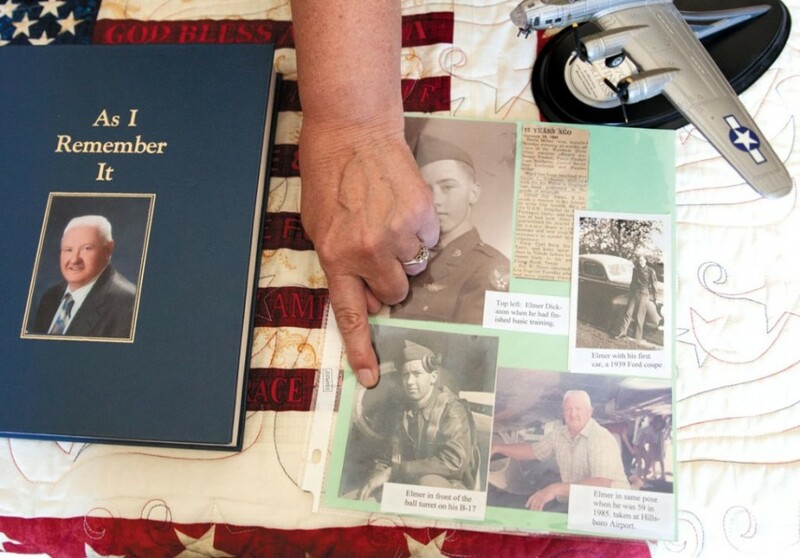 His family is planning a celebration of life at Logsden Neighborhood Church on Friday, Aug. 31 at 2 p.m.
As a ball turret gunner in World War II, he flew B-17 planes in the Army Air Corps, now known as the U.S. Air Force. Elmer flew 30 harrowing missions over Germany between 1943 and 1945, at one point almost crashing into a cliff. His station at the .50-caliber turret gun was small — a 40-inch diameter ball — and he’d be in that seat for hours at a time, according to his children. The temperatures on these bombing runs often dipped well below zero. Having seen combat, McGrath and Dickason said, there were a lot of things Elmer just wasn’t able to talk about, including enemy fire ripping into the plane around him. Like many of his generation returning from the conflict, he focused on life at home and put the horror of war behind him. “He didn’t talk much about it,” Dickason said. McGrath added her father opened up a little more about his service at the end of his life, but details were still few and far between. McGrath and Dickason are left with one story that they remember. McGrath went to Dover with her family many years later to see the cliffs her father barely survived during the war. The cliffs house a network of tunnels hastily built to defend against the Germans. Elmer received an honorable discharge in 1945 after being promoted to staff sergeant. He then came home to Siletz, where he went to work as a truck driver, accountant, logger, mill worker and construction contractor before he retired around 30 years ago. After he returned to Siletz, Elmer married the woman who would be his wife for almost 68 years, Betty Erickson, who died in 2015. In the years following his service, as he went to work and started a family, Elmer kept in touch with many of the fellow servicemen he saw at World War II veteran events. The children of this Lincoln County World War II veteran want those who served in the war to be remembered for their love for and dedication to their country.